If you're Kate Evans, you keep your friend Rachel, bond with her kids, and bury your feelings for her husband. The fact that Shane's in the military and away for long periods helps-but when tragedy strikes, everything changes. After Rachel, pregnant with her fourth child, dies in a car accident and the baby miraculously survives, Kate upends her entire life to share parenting duties. Then on the first anniversary of Rachel's death, Kate and Shane take comfort in each other in a night that they both soon regret. Shane's been angry for a year, and now he feels guilty too - for sleeping with his wife's best friend and liking it . . . liking her. Kate's ability to read him like a book may have once sent Shane running, but their lives are forever entwined and they are growing closer. Now with Shane deployed for seven months, Kate is on her own and struggling with being a single parent. Shane is loving and supportive from thousands of miles away, but his homecoming brings a betrayal Kate never saw coming. So Kate's only choice is to fight for the future she deserves - with or without Shane. 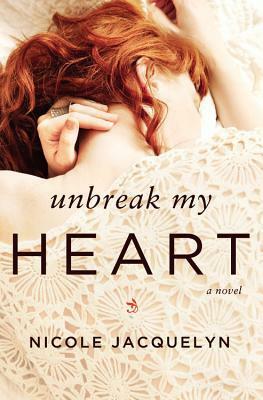 Unbreak My Heart was a very surprising read for me. Before I read a book I usually do a bit of research on it. I like to know certain things prior to diving in. This book was no different. That being stated, I had my eye on this one for a while and I really wanted to read it but I felt like I needed to prepare myself for a deep emotional read before going in. I have to say now that I have finished reading Unbreak My Heart it was not what I expected at all and I am pleasantly surprised! I enjoyed this story very much! It was real and raw and things did not always go the way they were planned. It dealt with real life issues and didn’t sugar coat them. Kate has been in love with Shane since they were teenagers but Shane fell in love with Kate’s best friend Rachel. Even through all this Kate & Rachel have remained best friends. Shane & Rachel have built a life and a family together until a tragic accident takes Rachel away. The relationship that Kate had with the children was heartwarming and endearing to me. The emotions, struggles and circumstances she faced “not being the real parent” were real but she never gave up. She loved those kids with her whole heart. The guilt that Shane felt was heart crushing. I mean, how do you know what your spouse would really want for you if something happened to them? I appreciated how things developed slowly. I loved the unconventional family unit they had and built upon. I didn’t find this to be a sad story at all. I found it be uplifting actually. I think as a woman and a mother all of us would wish and hope that we would have an amazing best friend such as Kate to step up and love our kids the way that she loved Rachel’s children. I applaud Nicole Jacquelyn for how she wrote what should have been a tragic story without it feeling tragic at all. It was touching and heartwarming. She created fantastic characters with just the right amount of drama and a story line that held my attention and left me craving for just a tad more.